We've partnered with Stripe to ensure you can take payments directly from your invoices. And we've removed all the fiddly admin so getting paid is so easy, you wont have to ask twice. The good news is, when you've already got Accounting, you can activate the new Stripe features with a simple click. Now customers can pay the moment they receive an invoice. Get a complete view of transactions, right from when the invoice is paid, to when the money enters your account. No need for you to deal with the messy bits of invoice payments when we do it all for you. No more chasing late payments. With the Pay Now button, customers can pay online or over the phone. A simple form fill pops up on their device and they can select the invoice then and there. Process credit and debit card payments, speed up the payment process, and add credibility to your business. Accept payments over the phone directly on your invoices from within Accounting to capture customer card details and process the payment. 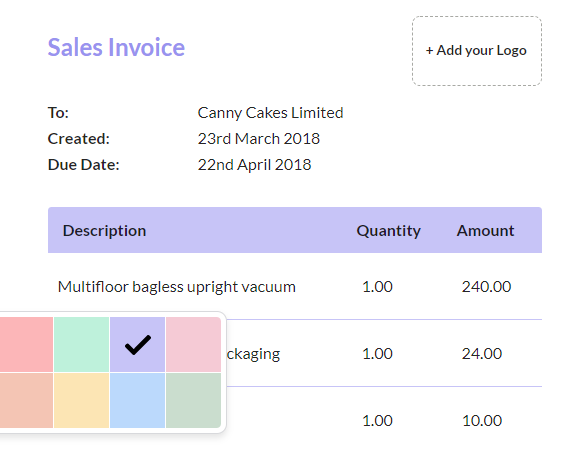 With customisable invoices, you can set a clear due date for payments, easily tailor them to reflect your brand, and send them directly to customers. And with a mobile-responsive format, it means the invoice can be read and paid on the go. With Stripe, all payments are tokenised and fully secure, so you don’t need to worry about managing card informaon or spend time on PCI compliance. No more bleary-eyed payment admin. As Stripe payments are made, we automatically match them to invoices and account for any fees in real-time without you having to lift a finger. This means your finances are always up to date and you have a clear picture of costs.. Create, edit and send invoices from your mobile – giving you full view of your accounts, wherever you are. With Stripe, you can see when you are due a pay-out from your invoices paid by Stripe, and when payment will land in your account, making reconciliation simple. It gives you greater control of your cashflow, allowing you to schedule when you get paid based on when the money needs to be in your account. No more processing payments manually. You can see whether an invoice is outstanding, viewed, or paid – and when the money will be available in your account. It means you can review and manage your incoming card payments as we automatically match them to your invoices. 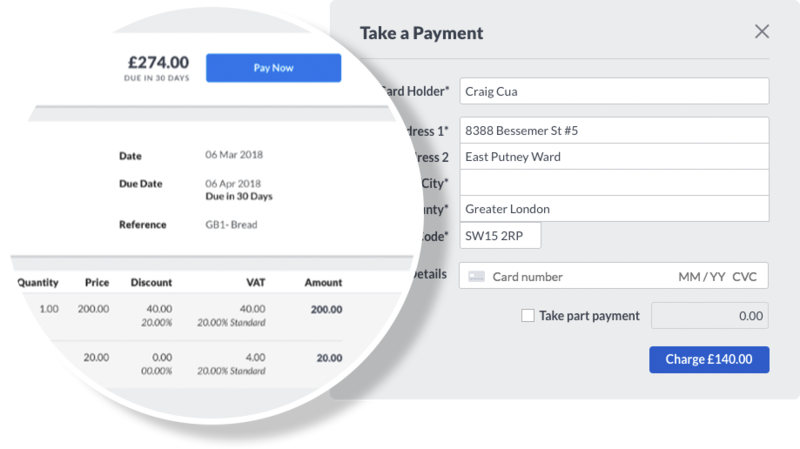 Pay-outs from Stripe are automatically reconciled against the relevant customer payments, which means that you no longer have to work out which payments a bank deposit actually covers. 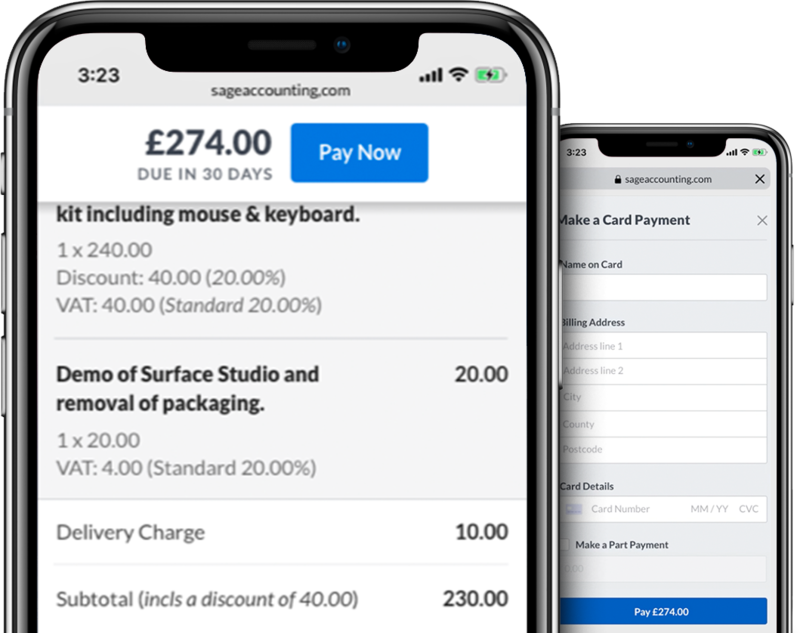 Combined with the automatic fee processing, Stripe and Sage Accounting truly deliver zero touch accounting. Invoice payments powered by Stripe provides such an easy way for your customers to pay, you can make sure you are always on the front foot. From gettng paid, staying on track with what you are owed, to processing payments – it’s all taken care of automatically, so that payments never spill into the valuable hours of your day, and you can focus on your business and your valuable customer relationships. .
or create a new account to get started.